How cute! I'd love to know what the two of them will think of it when they're older. Don't you buy those things in bulk? With four girls, you'd think you'd have a few extras laying around. Kind of like me and footballs. What a perfect moment captured! You sure called that right! Dolls, they are! Oh, I have to agree with the crown statement! My one daughter loves to get dolled up regularly! They are so cute! I have twins too but mine just turned 18! Boys, as different as can be. Thanks for visiting my blog, I really appreciate it. Stopping by from SITS to say HI! Your kids are adorable! Have a great week! You take the most adorable photos of your girls! What a couple of cutie pies! Stopping from SITS! What sweeties! Did the crownless one geta turn too? Oh I just want to reach through the computer and squeeze those little cheeks! 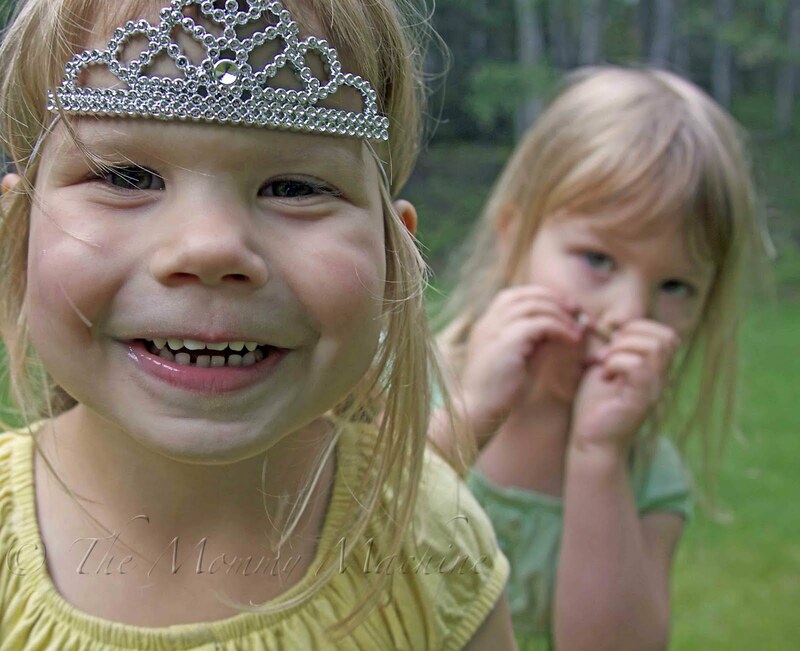 Tinkerbell LIVES in crowns and all that is considered princess dressup attire.